Just one chart today, because the market has reached the downside inflection point that we've been discussing for a couple weeks, and because I'm tired of Stockcharts deleting all my annotations and making me start over ever single time I want to simply update a chart. This is something it does on certain select charts because it hates me. Accordingly, I'm not going to even update this chart, because if I attempt to do so, I'll have to redo EVERYTHING on the chart. 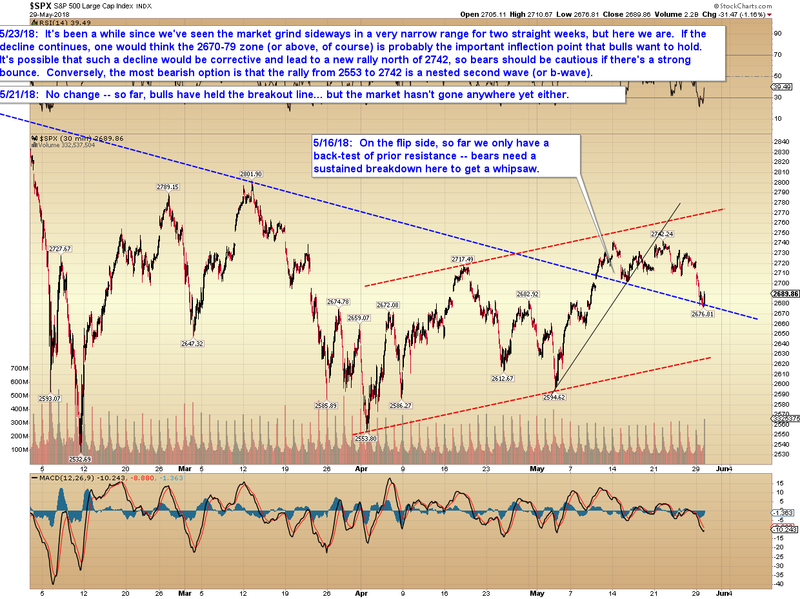 SPX has again tested the breakout line that we noted a couple weeks ago. So far that line has held. I'm tempted to say that this may be temporary, but I can't be very confident on that call. In conclusion, the market has reached its first downside inflection zone, represented by the prior breakout. If bulls can hold that zone, then they're cleared for additional rally, but if bears sustain a breakdown there, that would constitute a whipsaw and could suggest further downside. Trade safe.